Day 1350 - Happy Halloween! Greetings, Bloggy Trick or Treaters! Here's another photo of our favorite bumblebee. Don't forget to change your clocks tonight - fall back an hour vs. spring ahead an hour. I've got a wash going - wait a minute so I can change it over. Okay, I'm back. We don't have any plans today, but yesterday we went to see the movie 'Paranormal Activity'. There are several other movies I'd like to see, maybe we'll hit another one this weekend. Have fun trick or treating! Take pictures! Day 1349 - Halloween Eve! 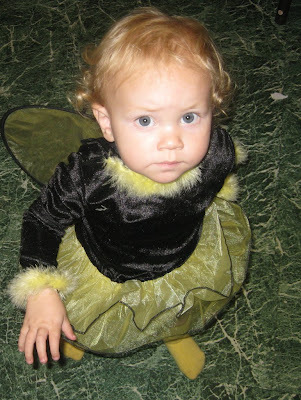 Here's Little Miss Adorable, dressed up in her Bee costume for Halloween. Too cute! I tried a new candy bar - Nestle Crunch Crisp, that tastes like a cross between a Nestle Crunch and a Twix bar. I like them! My favorite candy bars? Hmm - to name a few - Almond Joy, Mounds bars, Butterfingers, and Peanut butter cups. But I also love Chunky's and Heath Bars (toffee). Ok, now I'm hungry and I have to eat breakfast! TTFN and have a nice Halloween! 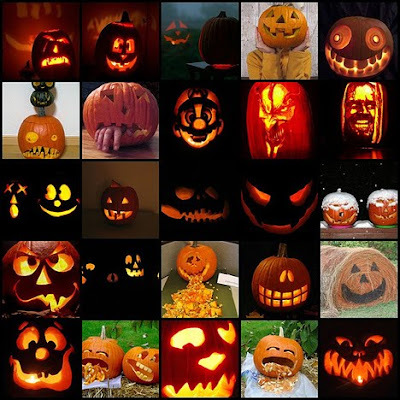 Here are more OUTSTANDING pumpkin carvings - just look at the one of Jack Nicholson on the right!! EEEK! I like the one with the hand sticking out of it too. Well - I won't blog long - you can chat in the comments if you want to. All of these photos OUGHT to be enough food for conversation. Day 1347 - Midweek, and my pumpkin is uncarved! 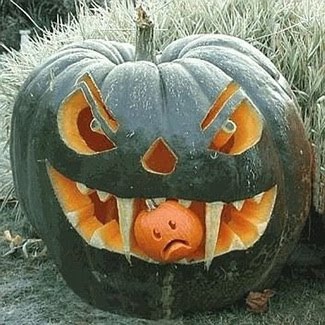 Here is another awesome pumpkin, gobbling another one. Oh no! This one looks really huge to me, or is that an illusion? My lonely, unloved pumpkin is sitting on the kitchen table waiting for someone to carve it. Who would that SOMEONE be? Well, I guess it had better be ME, eh? Maybe I should call the kids next door and ask one of them to come over and carve it. Thank you for everything, Debbie and Elaine! This afternoon two of my girlfriends are coming over to visit and bringing us supper. We are also getting a new freezer delivered today, because our old one keeps annoying me. Charlie has to fix it every few months, and the seal is letting cold air escape. Yay for the new freezer! Dream update - I dreamt I was on the upper floor of a house, and there were two rooms, side by side, each with a kitchen area. I felt comfortable in the house, like I had been there before. I was planning to make coffee, but I couldn't find a scoop. I grabbed some measuring spoons out of an RX-type pharmaceutical bag sitting on a shelf, (they looked like free samples), but a Russian-accented guy showed up and told me I couldn't use them. I apologized for assuming I could have one of them, SINCE HE HAD A WHOLE BAG FULL STUCK ON A SHELF ABANDONED (all the while thinking he was selfish not to just give me one of the stupid samples), but proceeded to make coffee anyway in the other kitchen. I discovered that there were all kinds of bags of coffee pre-measured in packages, though it looked like a huge amount for one pot. I have another dream to tell, I forgot about it till this morning, but it is too cool to pass up. I was part of a group bringing various products from the sea to market. We were in a convoy with a fishing boat up front, which contained traditional fish, and our group was behind it. Our group consisted of 3 supernatural beings (including me). Our harvest was two things - a vast bed of seaweed, and a live, wriggling mass of giant sea worms. The oldest member in our group controlled the movement of our harvest to market by singing to it, directing the speed and location of the masses of seaweed and writhing worms. I was trying to propel a small dingy, which I promptly sank, but for some reason we didn't need a conveyance to move along with our 'catch'. So - what does it mean? It was cold overnight- in the 30's. Last night Charlie built a fire, and the flame initially came up right in the center! 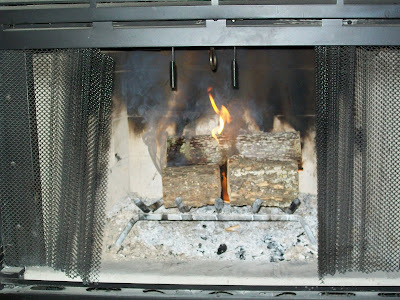 It looked like a little torch coming up from between the logs. It was so cool I took a picture of it. Bottom line - I got separated from the group during a food stop (going for ketchup), wandered around the whole place, and didn't have my cell phone on. My niece from California was visiting for the first time, and she was indignantly (and deservedly) upset and worried about my disappearance. Everyone else thought it was kind of funny when I finally turned on my phone. Alls well and Christmas is coming! TTFN! Day 1343 - Halloween approacheth! I spent the morning writing out and mailing my Halloween cards, so I won't write much here. Heather - what does your pumpkin look like? How about a picture? 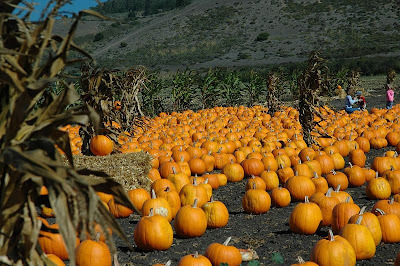 I don't have a pumpkin yet, so here are some I grabbed from the internet. 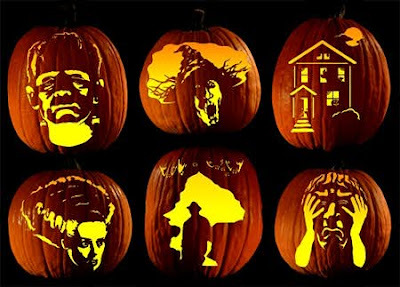 I think I'd like to have a pumpkin carving of a full moon and a cemetery... With a more traditional 'face' on the other side! I have a pork roast cooking in a roasting bag in my turkey roaster - I'm going to make BBQ out of it. We had some thunderstorms overnight, and it will be rainy today, but thankfully Charlie got the grass mowed earlier this week. Heather - are you feeling any better? I just lost half my blog posting- I must have lost connection for a minute. Drat! Did I tell you the neighbors horse got loose the other day? Charlie was taking me to a doctors appointment, and there was the horse, standing near their driveway. I called them to tell them the horse was loose, and it is safe and sound where it belongs now. 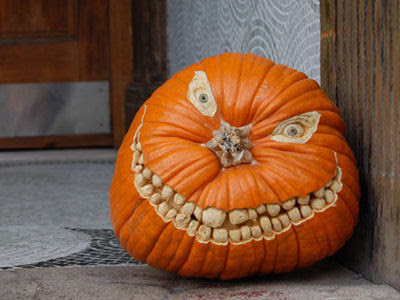 Anyway - I was also saying that I don't have a pumpkin yet, but I want some pumpkin seeds! TTFN and have a nice Friday! We passed a church sign in Franklin yesterday, just as it was getting dark. The church sign said 'God is bigger than the Boogeyman'. Well I should hope so! Hope he kicks some Boogeyman-behind too! 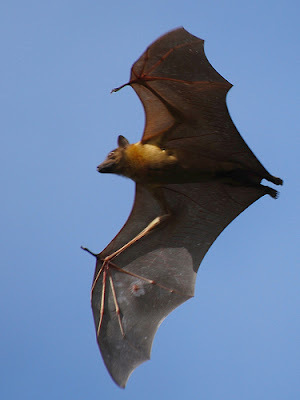 A few miles down the road toward home, we were accosted by a large bat, that came flying straight at us, swooping up and down. It went - swoop...swoop... SPLAT, as it hit the windshield and bounced away. We were shocked! Sorry PETA, we didn't mean to hit it, it hit US. So - Boogeyman is still with us, the bat is not. TTFN and hope you have a better Thursday! I didn't know about this early enough to tell you yesterday, but there were meteor showers last night, and will be for the next several nights. They are called the Orionid meteor showers, caused by Haleys comet. Charlie and I have gone to see these before, usually at a spot on the Natchez Trace Parkway or bridge. There are usually plenty of other people there, doing the same thing. One hippie-style dude walked by us one year and asked 'Got any rolling papers?' We didn't. 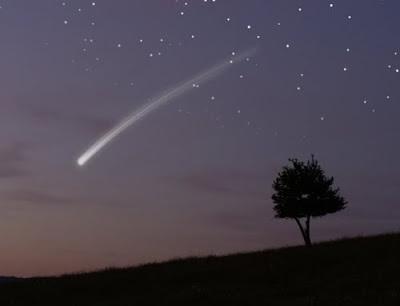 Tell me if you saw any shooting stars last night! TTFN and watch that starry sky! Day 1339 - Lions and Tigers and Goats, Oh My! Monday is gone, and it's all downhill till Friday! 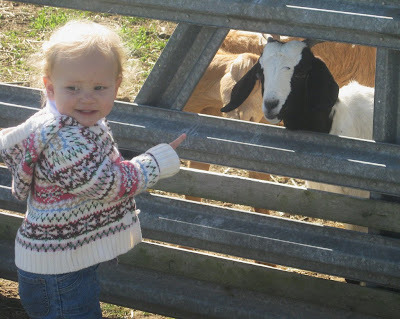 No, the pumpkin patch didn't have lions and tigers, but it did have goats, and pumpkins! Savannah loves animals, just like her mom! I like that 'oreo' goat, it's cute. We are supposed to have a couple of warm days today and tomorrow - all the way to 70 degrees! I'll take it. I like the fall weather as long as it's not too cold. Well - have a nice Tuesday and TTFN! Day 1338 - Hay is for.... Hayrides! Here is a sweet picture of Savannah taking her first hayride! 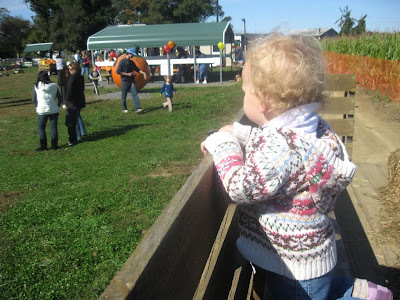 Heather said Savi just loved the hayride. I love her sweater, it looks so grown up! We had a nice weekend except for the Titans game yesterday - it was SO bad it was painful to watch. I did enjoy seeing the snowstorm, though - Heather - did it snow there? Have a nice day! TTFN! Here is a cute Halloween photo of Savannah with a BOO sticker on her head while Heather and her friend do Halloween crafts. I saw my SECOND Christmas commercial last night - if was a Kmart layaway commercial. Big surprise, huh? Thank you to TY and SY for coming by yesterday with a meal and an ORCHID! The care of this orchid is awesome, because you water it once a week using three ice cubes, and that is so easy even I can do it. Thanks, again, I love it! Day 1336 - The weekend is here! 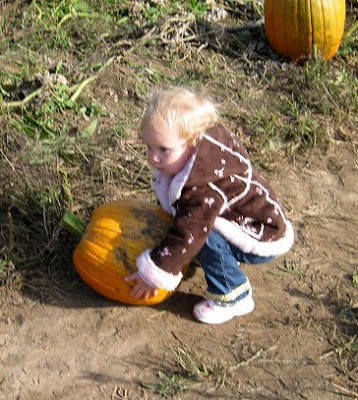 Here is Savannah, trying to heft a huge pumpkin. I don't think she could even ROLL that one! Heather - are you going again today? I didn't check the weather to see if it was raining there. Charlie took me on a drive yesterday, and we stopped to get a few groceries at Walmart. We saw a pumpkin that looked like it had a pregnant belly - it was $4 and I was SOOO tempted to buy it! Also - Walmart had REAL BUTTER for 99 cents a POUND - that is unheard of, after butter was $4 and $5 a pound for so long. I bought 2 pounds and froze one for the holidays. I am in the mood for macaroni salad later today, so I've got some rotini cooking. Day 1335 - Friday, or Saturday Eve! Here's another pumpkin patch photo of Miss Savannah. I think the pumpkin she is pointing to weighs more that she does! But next week is looking up, back to the 60's and 70's again. 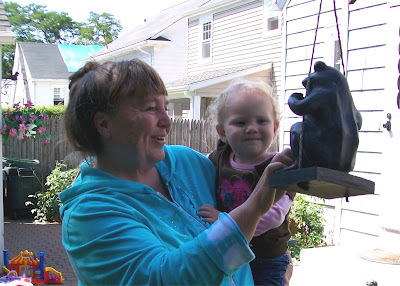 On a sad note, today my family is gathering for the funeral of my Aunt Kathy, and I wish I could be there. This has been a very tough year for my family! 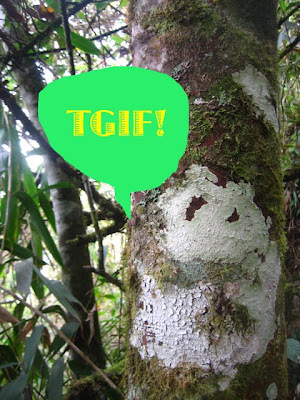 Have a good Friday and a good weekend, everyone! Day 1334 - Pumpkin Patch Princess!! 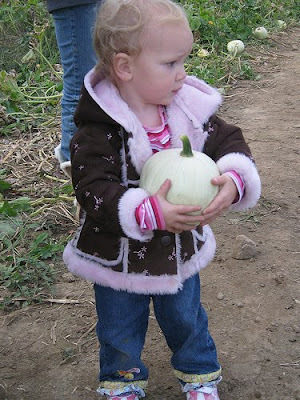 Here is an ADORABLE photo of Savi in the pumpkin patch. 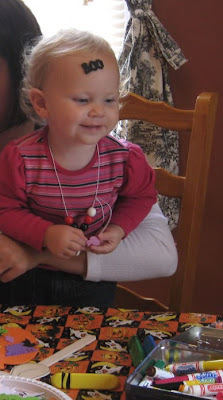 Look at that sweet face - Eloise Wilkin couldn't have used a better model (if she had known Savi). Heather - did she like the white pumpkins better than the orange ones, or were the white ones just an easier size to pick up? I like the white ones because you could draw or paint on them instead of carving them! It is raining today, but slowly moving off. And speaking of 'off' - we are off to the airport this morning so my mother can meet with her brothers and sisters for my Aunt Kathy's funeral tomorrow morning. We had the best visit, and since her trip was cut short, I have suggested she come back again. Happy Anniversary to me - it was 2 weeks today that I had my surgery, and I am doing well. Have a nice Thursday, everyone! Survivor Night, and tomorrow is FRIDAY! Day 1333 - Is it a Ribbon or a Rabbit? 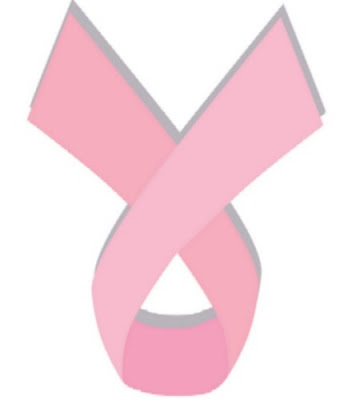 As you know, October is Breast Cancer month. I have a funny to tell this morning, and I'll try to make it quick. I hope it's still funny after I tell it! I have a new charm bracelet, kindness of my friend Cheryl. Thanks, Cheryl! It has various charms including swarovski crystal beads, and a lovely, silver breast cancer ribbon charm. The charms are unique, because each of them has an individual clasp attachment that you can use to move them around, add or subtract. So, this morning I was showing Charlie how the little charms attach, and he was suitably impressed! Thanks, Charlie - for the inspiration for the blog today! Happy Birthday to Daddy Gil today - and being polite, I won't say which one. He'll have a busy morning, full of appointments and a birthday lunch out with his daughter. Have a great Birthday, Gilbert! At the same time we celebrate birth, I also have had some sad news. My Aunt Kathy in New Jersey lost her battle with lung cancer last night, and the phone has been ringing with family news. Kathy was a golfer, skier, hiker, and so many other things. She had a very large family and an even larger heart. We'll miss you, Kathy, and we love you! Day 1331 - Columbus Day! Happy Columbus Day, even though lots of people have to work today. Columbus Day means we won't get any mail today - drat. Retirees and people recuperating at home look forward to the mail, as long as it is not full of bills. 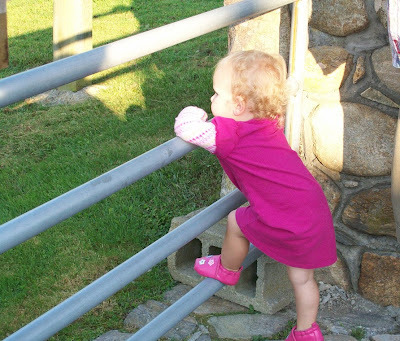 Aunt Nancy requested this photo of Savannah, 'hanging out' against the fence just like a 'big kid'. Yesterday was my nephew Charles's birthday - Happy Belated Birthday, Charles! Today is gray and drizzly - might be a good day for HOMEMADE BREAD, made by MOM! I saw that one yesterday on Harding Road on the way to the airport to pick up my mother. We are already having a wonderful time, chatting and EATING. Charlie made eggs, blueberry pancakes and bacon this morning. Thank you, Charlie! YUM-O! 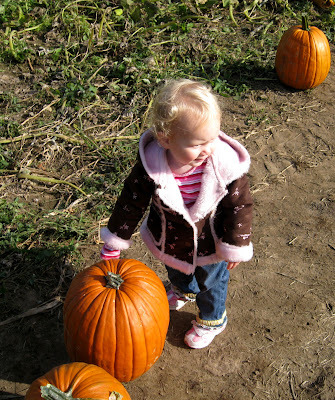 Heather and Savi Lynn are going to the pumpkin patch today, and I hope the weather is good! By the way - I saw my first CHRISTMAS commercial this week - have you seen any yet? I think that is ridiculous, however, I am going to put up my tree as soon after Thanksgiving as possible. So, that means I'm a hypocrite and proud of it. I am too lazy to blog today - stayed in bed until 8am, doing a wash, and reading. Have a nice Saturday and my mother arrives this evening! Day 1328 - Friday, Hooray! Today is a special day for me, because I am getting my drainage tube out. While I understand it was necessary, this plastic tubing attached to me has made it impossible to rest comfortably at night! I woke up at 2am last night, and catnapped for most of the rest of the night. We have some thunderstorms on the way today, but they are north of here at the moment. It is 72 degrees first thing in the morning, and cold air hitting warm air is pretty much a given. A cool front is coming through after that - with temps in the 60's expected most of next week. TTFN, have a great Friday, and a great weekend! Greetings, Bloggy Post Surgery readers! My surgery was one week ago today. I am still sore and black and blue, but doing fine. 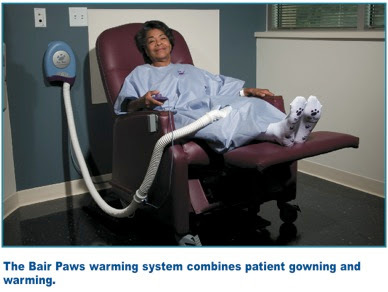 I realize that I forgot to tell you about the 'Bair Paws' hospital gown system I used at St. Thomas hospital. I got this photo from the web, though I think Charlie took a picture of me in my getup on his cell phone. It was pretty neat, and eliminates all the laundering and heating of hospital blankets while keeping the patient evenly warm. Bottom line - you put on a paper hospital gown that works like an oversized vacuum cleaner bag. There is a hose that attaches and blows warm air into the gown (you have a thermostat dial to adjust how warm you want it). You can lie there toasty and warm without asking for a blanket or having all the blanket weight on your surgery areas. Is that cool or what? Have a nice Thursday, everyone! Have I already posted this picture? I can't remember. 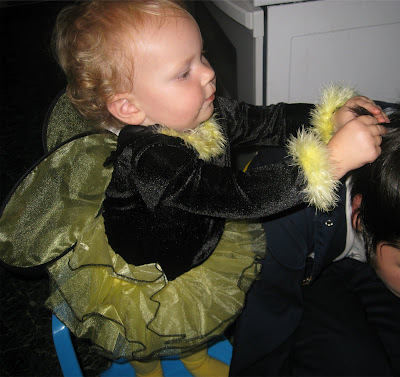 This is me with little Savi - tickling a garden frog. I would tickle the frog but Savannah would laugh... Cute! 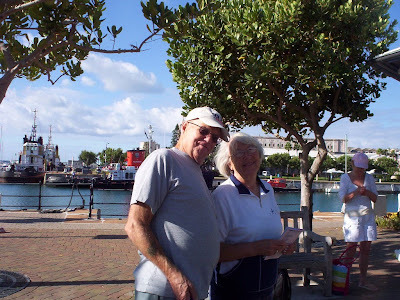 Lyn and Steve visited yesterday, and we watched baseball, and Lyn cooked Chourico and beans for supper - it was DELICIOUS. Lyn and Steve were surprised that a little trip to the store for some crusty bread to go with the Chourico and beans was a 40 mile round trip undertaking... This is NOT like the city! She also folded laundry for me and loaded the dishwasher. Thanks, Lyn! I had a better sleep last night than I have since my surgery - thanks to the nest of pillows Charlie fixed up for me - two behind my head and one on either side. Have a nice Wednesday everyone - I think we are going to the Walmart hairdresser today so they can wash my hair! Day 1325 - Company coming! 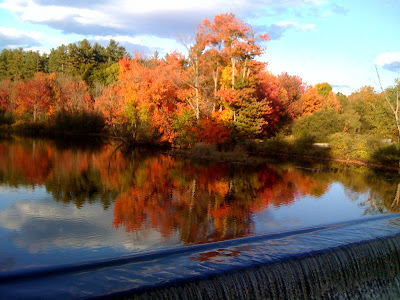 Here is a fall photo scene near the Handy Store in South Paris, Maine. Thanks, Roving Reporter Aunt Nancy for the photo! Guess what? My sister and brother in law have surprised us with a visit, all the way from Little Rhody. My sister is a nurse, so I'd better look sharp and mind my P's and Q's while she is here. No lifting, no straining, no popping stitches. Have a nice Tuesday everyone! Day 1324 - Happy Birthday, Charlie! No, I am not telling which one it is, just that it is an 'important one'. 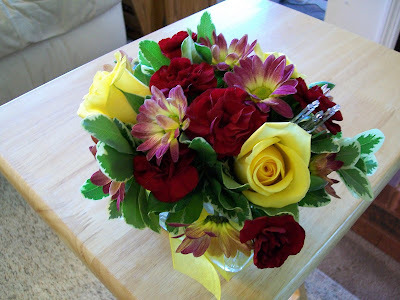 Here are some of the beautiful flowers I received after my surgery. They are in a heavy glass cube. I'll share them with Charlie for his birthday. Have a nice Monday, everyone! 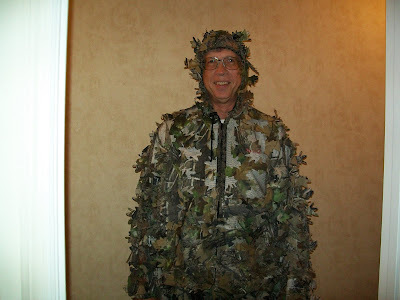 Today's photo is of my guardian angel, Charlie - dressed in his 'leafy' camo gear. Isn't this the most awesome suit? Charlie helped me wash my hair this morning - what an undertaking! I feel like a new person now that I have clean hair, I needed that! Tomorrow is Charlie's birthday, so today is 'Birthday Eve'. 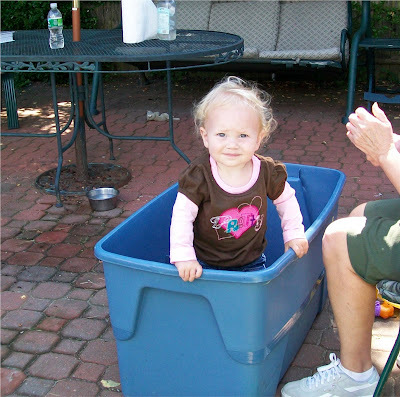 Here's a cute picture of 'Savi in the bucket'. What a sweet expression. I am still stiff and sore this morning, but nothing I can't handle. Charlie is making turkey sausage and eggs for breakfast, which is sounding mighty good. Last night Charlie made seafood chowder. Seafood chowder is very easy to make this way: use a can of clam chowder, 2 cups of milk, and 8oz of frozen shrimp. Voila! Top with fresh chopped green onion and black pepper. Sometimes I add sauteed onion or cajun spice to it. Have a nice Saturday! TTFN! 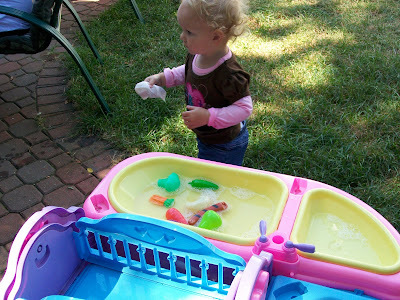 Here's a cute picture of Savannah playing with her little sink set. She would wet the dishcloth and then wash US on the hand or arm. Very cute. I am a bit stiff and sore this morning (of course), but with Charlie's help, managed dressing and getting my hair in a clip. I have a funny story from the hospital yesterday. One of the nurses (our EMA nurse on the 'Early Morning Admissions' floor) was walking me through a bunch of questions on her checklist. The only question I asked her over again was when she asked 'Do you have any hearing problems?' I said 'What? Can you ask that again, I didn't hear you!' We all had a big laugh after that. I mentioned this in yesterdays update, but I have some lovely black and blues appearing where they tried to put the IV in FIVE different places (two on my hand, one on my wrist, and two on my forearm) before settling on the GOOD vein I always use when giving blood, which I informed them of before they started. Anyway - I am feeling good, and Charlie is going to get me a chicken biscuit for breakfast, which I have been craving since last week. Once I get a craving going, I am not content until I get whatever it is I crave! Have a nice Friday and a nice weekend! Day 1320 again - I am HOME! I am home, and Charlie is busy fixing up an ice pack for me. Thanks, Charlie and the family and friends who came to the hospital to see me in the 'early admissions' unit. I even had a room, which was more like a cubicle with a drape than an actual room, but it was nice. My surgery was at 8, and the last thing I remember about that is seeing a TV monitor start to 'swim', and then I was out. I feel pretty good, no nausea and not too much pain yet. The surgery went as expected, and took between and hour and an hour and a half. I have several black and blues from technicians trying to find a good vein in my hand or wrist rather than using the PERFECT vein in the crook of my arm. They ended up having to put the IV there anyway after multiple failed attempts. The 'lead' technician quipped 'Any port in a storm' when they decide to go with the crook in my arm. I started to wake up around 10:30, and was released at 1:30. I'm going to rest now! Love you bye! Day 1320 - Mack the Knife? Eeeeew! Happy October! Are you watching the MOON? It is awesome. 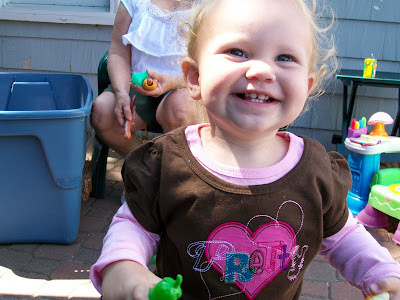 See - it made Savi smile too, and that's even more important. To capture a nice smile like that on film (or disc) is a grandmothers DREAM, I tell you. And since I'll be in 'la-la-land' today, I probably won't be dreaming at all - just in some other vacant state of being. I have to be at the hospital at 5:30, and my surgery is at 8am SHARP (another Mack reference). Chat among yourselves using the comments, and Charlie will post something when we return from the hospital. TTFN and have a nice day! Go stop at a hospital and try out their excellent, low cost FOOD.